A popular mail filter is one that moves SPAM messages to a Spam folder (or some other folder to be reviewed later). 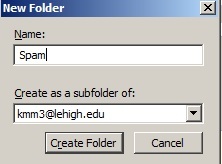 The following example shows the criteria used to move SPAM to a Spam folder in Thunderbird. If you don't already have a spam folder, create one in Thunderbird by clicking File > New Folder, and then name the folder and click Create Folder. To create a spam filter, click Tools > Message Filters, then click the New button. 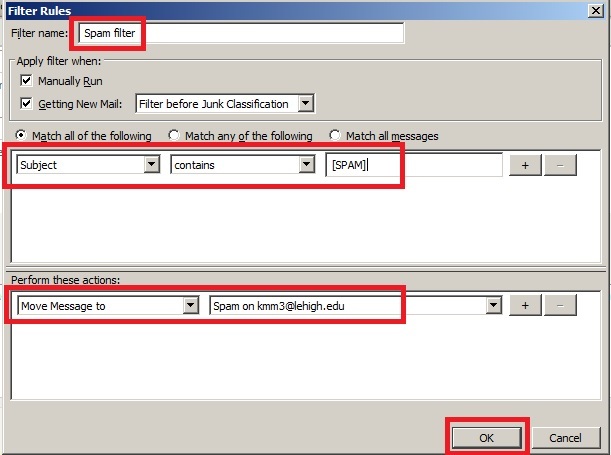 Name it Spam Filter and then set the filter criteria and an action to take on those messages, as shown here. When finished creating your filter, click OK, then close the Message Filters box. Note: In this example, spam will be moved to a Spam folder, but you can choose any Mail folder, such as Trash.